While temperatures this month are a bit cooler than peak summer, April is among the best times to visit New Zealand. Considered a shoulder season, rates for travel and accommodation are much less than during summer's peak travel season. Additionally, New Zealand's trees are changing, making for a colorful show, especially in areas such as Central Otago and Hawke's Bay. The country has no native deciduous trees (they are all evergreen), but European settlers brought with them many trees such as oak and maple. As they shed their leaves at this time of year, they create a beautiful effect in many parts of the country. With cool temperatures, this is also an excellent month for hiking, fishing, and other outdoor activities. Temperatures become noticeably cooler in April. Both the North and South Islands experience sunny days with pleasant daytime temperatures that fall at night. The further south, of course, the lower the temperatures. As the weather patterns change the weather can also be somewhat variable, with brief stormy and rainy periods. 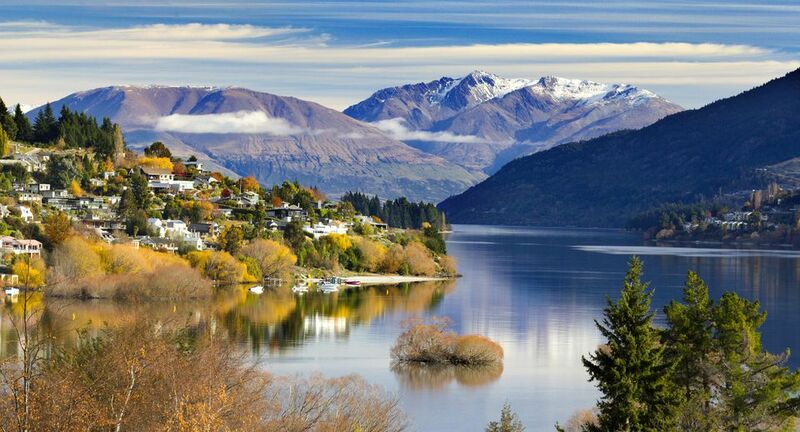 In general, however, April is one of the most settled months, although New Zealand's maritime climate means that "settled" is a relative term. Overall, New Zealand is exceptionally sunny in all seasons, with most parts of the country receiving more than 2,000 hours of sunshine per year. UV rays here are powerful, and it's still possible to get sunburned well into late April, so prepare yourself accordingly. Fall is prime time for unusual New Zealand events, which showcase the country's unique history, culture, and sports. Anzac Day Dawn Service: This moving event is held on April 25 at the Auckland War Memorial Museum and commemorates the end of World War II. The Jim Beam Homegrown concert: This exciting music festival takes place in Wellington in early April. The concert draws more than 40 local acts, who perform across five stages. Arrowtown Autumn Festival: Held in Christchurch, this multi-day event includes a wide variety of events ranging from street entertainers, a parade, variety concerts, and even a barbershop quartet competition. Titirangi Festival of Music: This annual non-profit festival celebrates New Zealand's unique music and culture. It takes place in Auckland. Dates vary year to year, but it's typically held in early April or late March. Softbait Fishing Championship: New Zealand's competition is similar to a bass fishing tournament in the U.S. Anglers are judged on their ability to catch multiple fish throughout the tournament, not on the heaviest catch. The championship is held in Coromandel in early April. Warbirds Over Wanaka: One of the best air shows in the world, this annual event combines classic vintage and veteran aircraft with machinery, fire engines, and more. It typically takes place over Easter weekend. Fall colors are at their best throughout the country during April, but it's also a low season which means there aren't many crowds. Unfortunately, the cooler weather means that it's not the best time of the year for watersports, but a few of the northern beaches, like Pakiri Beach, outside of Auckland, are still warm enough for swimming. Daylight saving time in New Zealand ends on April 7. Because of this, days will be shorter with less daylight.